Is a past conviction keeping you from being able to own guns in Arizona? Is losing this right causing you distress? We have handled more than 1,000 cases in Arizona. We can use our knowledge to help you. Both the Arizona and US constitutions guarantee the right of citizens to be able to bear arms. From our nation’s beginning, Americans have cherished a lasting belief in the right to personally own guns and in the lawful use of these guns in self-defense, hunting or sport. Losing this right can be a disturbing reality for those with past convictions. Arizona law does allow for restoration of these rights in certain cases and we would be happy to assist you to regain your rights. Arizona law provides two methods for restoration of firearm rights. If your offense was not a "serious offense" you may either set aside your conviction or petition the court two years after probation is completed or the date of absolute discharge from imprisonment. If you were convicted of a serious offense or what would be a "serious offense" under 13-604 (first degree murder, second degree murder, manslaughter, aggravated assault resulting in serious physical injury or involving the discharge, use or threatening exhibition of a deadly weapon or dangerous instrument, sexual assault, any dangerous crime against children, arson of an occupied structure, armed robbery, burglary in the first degree, kidnapping, sexual conduct with a minor under fifteen years of age, or child prostitution), you can have your Second Amendment rights restored 10 years after you have been discharged from probation or released from prison. If your offense was considered a "dangerous offense" (This usually means a felony conviction involving the intentional or knowing infliction of serious physical injury or the use or exhibition of a deadly weapon or dangerous instrument), Second Amendment rights cannot be restored. Restoration of firearm rights will allow a person to own, possess or use a firearm as long as they are not restricted according to the federal domestic violence ban. Check if you are eligible to regain your firearm rights in Arizona by taking our free online evaluation. 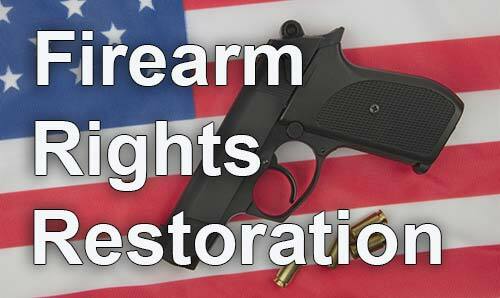 Firearm restoration cases can take up to 5 months or more in Arizona. We handle your case from start to finish. We will do research, compose and file motions, answer prosecutor opposition, and send our attorneys to court to advocate for you. All this for one flat fee with no surprise costs, backed up by a low-price guarantee. Get started with $49.00 Plus 2 interest-free monthly payments of only $423.00. Get started with $1500.00 Plus 3 interest-free monthly payments of only $1500.00. * * This price includes filing fees and court costs. In some instances a report from the Department of Public Safety may needed, which may require you to be fingerprinted and to pay an additional approximate $25. If you sign up for setting aside of a "serious offense" conviction then firearm rights are $250 in addition to the setting aside.